Making pixel art requires graphical software. Some software makes it easier than others. Here below I will write about the ones I recommend, feel free to add your favorite, or ask software related questions! GraphicsGale has recently become freeware! 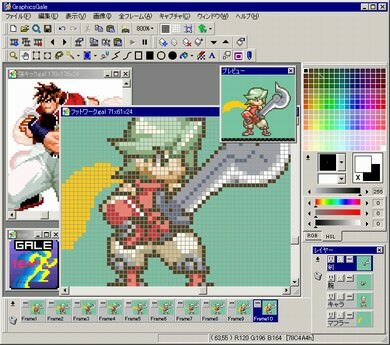 This wonderful software is ideal for animating pixel art. It supports layers, onion skinning, indexed palettes, sprite sheets and has many more nifty tools. 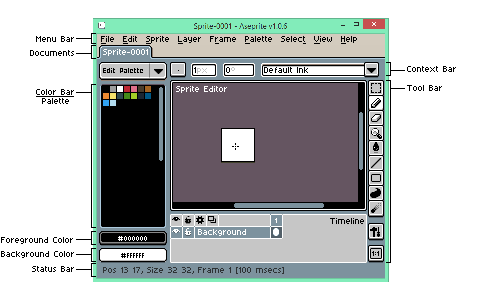 Aseprite is trying very hard to be the most complete pixel art editor, and has great support for layers and animations. Other features which stand out are selection tools, and it's constant updates. I'm currently using GIMP, but, it has the worst shortcuts of all drawing programs in existence: there is no way you can bind color picking (the most important operation after painting itself) to the right mouse button and eraser is bound to SHIFT-E! Why, God?!! Why adding shift? But truly the worst is animating with GIMP: compared to Adobe Photoshop, GIMP doesn't have layered animation or onion skins, and you have to install this glitchy barely maintained GAP toolkit and split your project into a mess of *.XCF files - one for each frame (yes, separate XCF files, instead of frames sharing a set of layers). After installing GAP on a 64-bit system, there are a number of DLLs that fail to load and startup time becomes even longer. I'm surprised that for several decades GIMP community has failed to implement something as simple as proper animation support. But well, same is true for Audacity vs Adobe Audition, which has nice pitch filters following envelope and spectral editing capabilities, surpassed only by SpectraLayers. I asked on their mailing list why don't they have proper spectral editing, and they answered something about it being implemented long ago, but patches were rejected, due to the development organization. So yeah, Photoshop is still the best tool out there, the only problem is a little slow startup and resource consumption on older PCs, but then you can probably find older Photoshop version, for say Windows XP - it would still be order of magnitude better than GIMP. I'm currently learning how to use this software and I'm really impressed so far. It's made specifically for pixel art. If you can get used to the hotkeys, I'd say this offers the fastest possible workflow along with every tool or function you could possibly want when it comes to pixel art. It might have a steep learning curve though. I used it for a short time. One thing I didn't quite like about it is that if you change one of your colors on your palette, it doesn't change that color where you used it on your canvas. So no canvas-palette connection. Also, if you want to always start off with a blank palette, you first would have to create a blank palette, but the good thing is that you can save and set that palette to default. Really great and simple software to use. Those were just some of the things I found in the short time I used this software. I think GIMP is great. If you're really good at drawing or sketching out your art, you can use GIMP to pixelize it. Doing straight up pixel art, you really need to know how to set GIMP up for it. 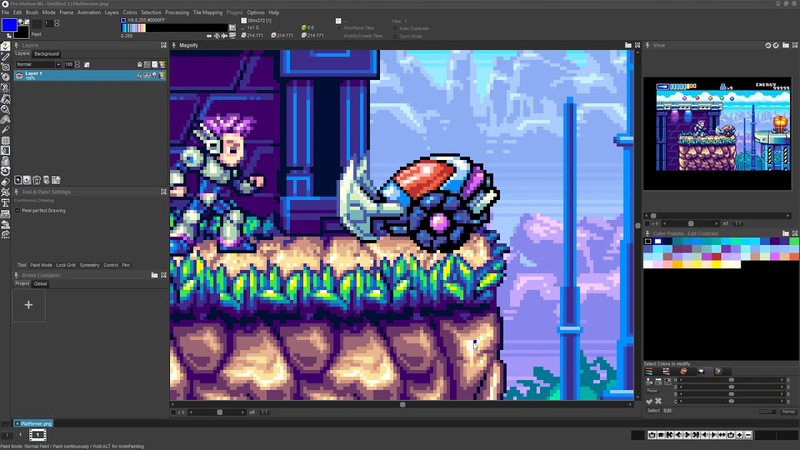 GIMP even has a way to animate your pixel art and you can get onion skinning to work too. Personally, one of the easiest programs I've used. Yeah. 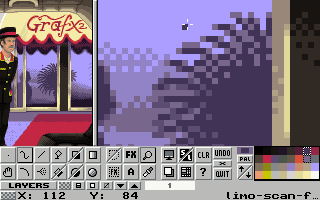 I heard Pro Motion is the best pixelart editor out there, supporting advanced stuff, like color cycling. Haven't tried it though. use 8bpp or lower in new file or color depth. any good software for chromeOS? If your passion doesn't has limits and you want to pixel in the bed (like me) I have found an ultracool Android app called Pixel Studio. It's FREE, but you can get PAID version, that allow resolutions up to 1024 and preset color palettes (no much sense). Hope you find it cool. Another Android app very strong is "Pixly", great for the bed. There's a nice little app for smartphones Dotpict. It's free, but you can purchase it and remove the adds.